Also serving communities of Newton Falls. There are 13 Assisted Living Facilities in the Warren area, with 4 in Warren and 9 nearby. The average cost of assisted living in Warren is $3,500 per month. This is higher than the national median of $3,346. Cheaper nearby regions include Niles with an average starting cost of $2,985. To help you with your search, browse the 42 reviews below for assisted living facilities in Warren. On average, consumers rate assisted living in Warren 4.3 out of 5 stars. Better rated regions include Niles with an average rating of 4.5 out of 5 stars. Caring.com has helped thousands of families find high-quality senior care. To speak with one of our Family Advisors about assisted living options and costs in Warren, call (855) 863-8283. Neil Armstrong took his first ride in an airplane in Warren, Ohio, a medium-sized town between Youngstown and Cleveland. There's a small monument on Parkman Road where it happened, and it makes a good spot for seniors from the town's 22 assisted living communities to visit with family and friends. 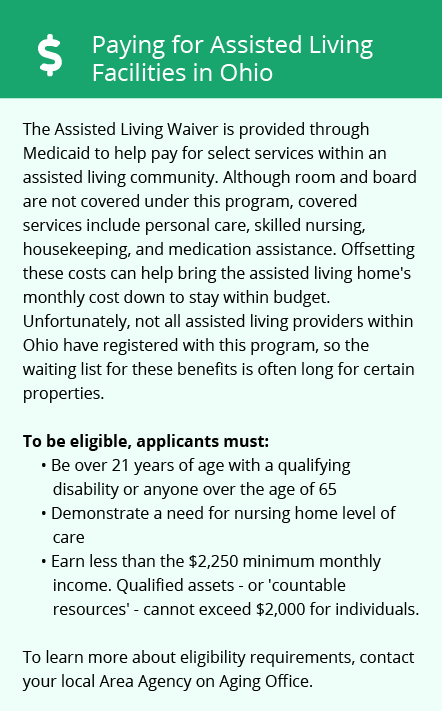 The Ohio Department of Health’s Office of Health Assurance and Licensing publishes guidelines for the state's assisted living communities that encourage staff to help seniors live independently. This is done by supporting residents with room and board, 24-hour emergency response and help with their normal activities of daily living (ADLs). Weather in Warren makes for mild summers and sometimes-chilly winters. The city sees summer highs of 83 degrees Fahrenheit in July and August, but average December lows can dip to 17 degrees Fahrenheit. Warren gets 40 inches of rain and 31 inches of snow in a typical year. This can make for a beautiful white Christmas with grandchildren, though the cool, dry air may aggravate COPD and asthma for some seniors. Cost of living in Warren is not bad for most seniors. Aging citizens who shop for their own groceries can expect to pay just 87 percent of what their food bills would be elsewhere, while health care bills in Warren average only 85 percent of the national rate. The income tax Warren residents pay is split between the 0.495 to 4.997 percent state tax and a 0 to 3 percent local tax, which is typical for Ohio. SSI and many types of retirement income are exempt, however, so it's worth meeting with an expert who knows local tax law. Sales tax in Ohio runs from 6.5 to 8 percent, which can pinch seniors on a fixed income. Crime is higher than average in Warren, though most of the trouble in town bypasses seniors. This is especially true for most property crime since assisted living communities are required to have staff on duty 24 hours a day. Trumbull County Transit covers much of the public transportation for Warren, with senior discounts and ADA-compliant vehicles for riders with disabilities. The Warren area is home to world-class medical facilities, including St. Joseph Warren Hospital, in the event of medical emergencies or illness. Assisted Living costs in Warren start around $3,500 per month on average, while the nationwide average cost of assisted living is $4,000 per month, according to the latest figures from Genworth’s Cost of Care Survey. It’s important to note that assisted living rates in Warren and the surrounding suburbs can vary widely based on factors such as location, the level of care needed, apartment size and the types of amenities offered at each community. 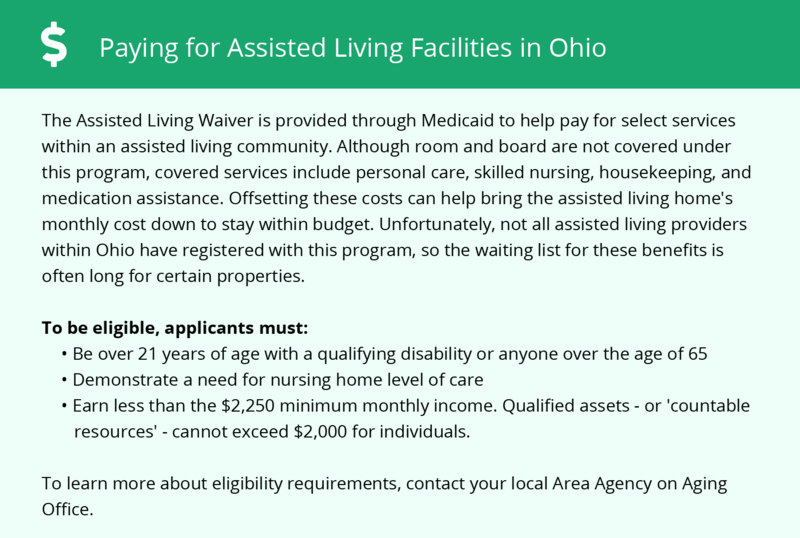 Ohio offers an Assisted Living Waiver program and a residential state supplement to help seniors cover the cost of assisted living. To see a list of free assisted living resources in Warren, please visit our Assisted Living in Ohio page. Warren-area assisted living communities must adhere to the comprehensive set of state laws and regulations that all assisted living communities in Ohio are required to follow. Visit our Assisted Living in Ohio page for more information about these laws.